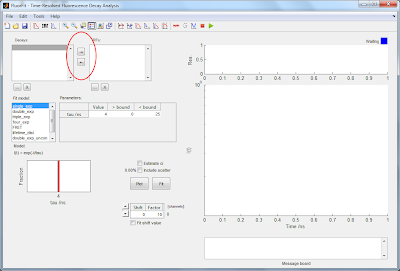 Format input data in version 1.2 and earlier - The fluorescence laboratory. Note: In version 1.3, the data import was changed so that it is no longer needed to format your data files in any particular column order. The information below governs versions 1.0-1.2 of the software. 1) A single column data structure will be interpreted as an intensity vector (decay or IRF depending on which is being loaded). The program will ask the user to specify the channel time width when loading the data. This definition is applied independent of whether an IRF or a decay is being loaded. - If the file contains more than four columns, column data above four will not be read and the first four columns will be interpreted according to case 4) above.